A 60-minute treatment applied to expression lines with precision. The treatment is massaged into the skin, algae pellicles are applied, activated and covered with a thermic sheet. Treatment is completes with the Corrective Cream, reducing expression lines and wrinkles, giving you a more youthful, refreshed look. 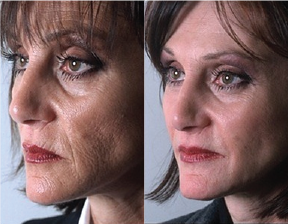 A 75-90 minute intense, rejunivating treatment to dramatically reduce visible lines and wrinkles. Energizing Serum is applied to the skin, followed by massaging Intensive Complex into the skin. Treatment is completed with an application of velvety Vitality Cream, leaving you rskin feeling as silky smooth as it looks. Five different chemical peels to choose from: Derm Renewal Peel 30, Glycolic Acid Peel 30, Lactic Acid Peel 30, Modified Jessner Peel and Salicylic Acid Peel 30. All are formulated for different skin types to fight the appearance of fine lines, wrinkles and congested skin.